A lot of techs have problems with "corn rows" in their dents. For those that may not be familiar with this term, corn rows are those parallel rows of micro ridges and creases that many techs see as soon as they cross check their dents. 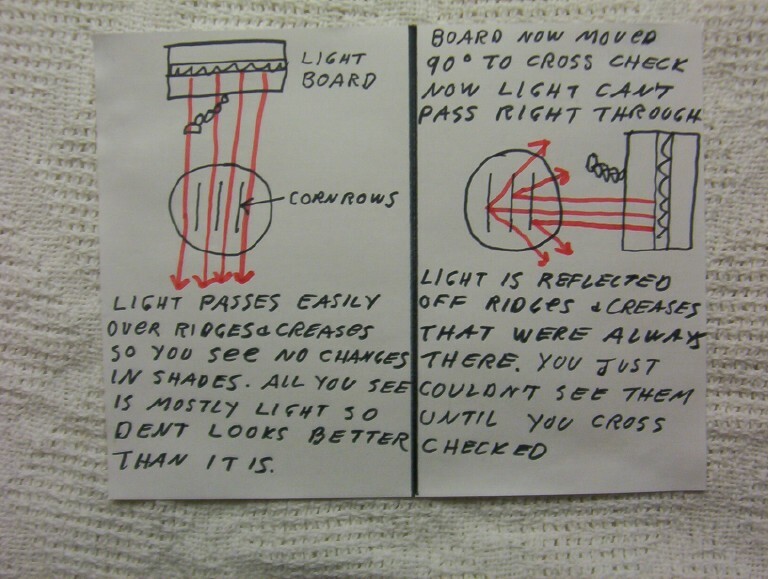 The main reason they aren't seen until you cross check, is because light runs right through the micro ridges and valleys when they are perpendicular to your reflective source, because there is little for the light to reflect off of. This makes this area of the dent look fairly uniform, even though it isn't. 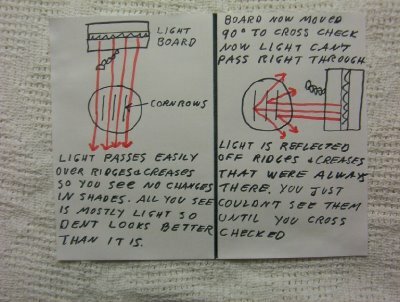 When you cross check by moving the board 90 degrees, you see the rows because the light is now reflected off the ridges and valleys, the light can no longer run right through them. See illustration #1. Most often, the tech who gets corn rows is ..